I was recently honored with the opportunity to judge an exhibit of 50 works of art for the Mesa Art League. This is the group’s third event at the Gammage. It’s a multi-media show that includes oil, acrylic, & watercolor paintings, photography, and mixed media. 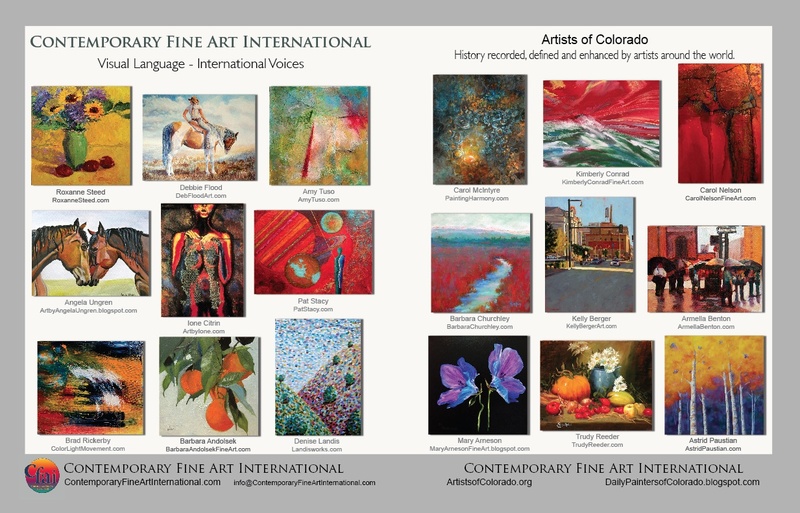 Artists include Alicia Short, Alma Kreiger, Anthony DeNunzio, Bud Heiss, Chere McKinney, Chris Morningforest, Diana Kempton, Elaine Dube, Freddie Jasper, Irene Leach, JoEllen Delcoure, Judy Koppes, Kathleen Maley, Kimberly Smith, Len Goldman, Linda Allen, Nancy Long, Pat Book, Peggy Wrobleski, Reed Kempton, Roberta Skolnik, Robin Blatell, Sherri Aldawood, Sheryl Stradling, Suzanne Tyson, and Terri MacDonald. Go see the exhibit and let me know if you agreed with my selections for Best In Show, 1st, 2nd, & 3rd Places and 2 Honorable Mentions. Call 480.985.0458 or 480.965.6912 for exhibit hours. It’s a beautiful display of many skilled artists from the East Valley. Every now and then I come across a non-art related email or article that “hits me” and I want to share it with fellow bloggers. I call it “Fluff” stuff in my blog. So this was not written by me but I’m so happy to read it. Hope you are too. An evening class at Stanford focuses on the mind-body connection – the relationship between stress and disease. The speaker (head of psychiatry at Stanford) said that one of the best things that a man could do for his health is to marry a woman, whereas for a woman, one of the best things she could do for her health was to nurture her relationships with her girlfriends. Women connect with each other differently and provide support systems that help each other to deal with stress and difficult life experiences. Physically this quality “girlfriend time” helps us to create more serotonin – a neurotransmitter that helps combat depression and can create a general feeling of wellbeing. Women share feelings whereas men often form relationships around activities. They rarely sit down with a buddy and talk about how they feel about certain things or how their personal lives are going. Jobs? Yes. Sports? Yes. Cars? Yes. Fishing, hunting, golf? Yes. But their feelings? Rarely. There’s a tendency to think that when we are “exercising” we are doing something good for our bodies, but when we are hanging out with friends, we are wasting our time and should be more productively engaged – not true. In fact, he said that failure to create and maintain quality personal relationships with other humans is as dangerous to our physical health as smoking! And, “thank you” to my special gal pal for sending this my way today….. In 2010, there were 35 new posts, growing the total archive of this blog to 81 posts. There were 71 pictures uploaded, taking up a total of 80mb. That’s about 1 pictures per week. The busiest day of the year was November 1st with 126 views. The most popular post that day was Artizona Blog. The top referring sites in 2010 were facebook.com, mail.yahoo.com, en.wordpress.com, mail.live.com, and search.aol.com. Some visitors came searching, mostly for pointillism, pointillism art, pointillism artists, pointillist paintings, and flower power. Elvis Presley, known primarily for his singing and risqué stage moves, also created twenty-nine movies in which three were actual westerns and several included western scenes. Charro (1969) starring Elvis Presley was made at Apacheland Movie Ranch at the peak of his career. It has been called his best acting work. Apacheland was a well-known film and TV recording studio in Gold Canyon, AZ that tragically burned in 2004. It was a tragic loss to local residents as well as to the movie industry and the many tourists attracted to the lifestyle of the Old West. However, the Apacheland barn and chapel survived. Both were carefully moved to the Superstition Mountain Museum located on the Historic Apache Trail (AZ Route 88) outside Apache Junction approximately 32 miles east of Phoenix. 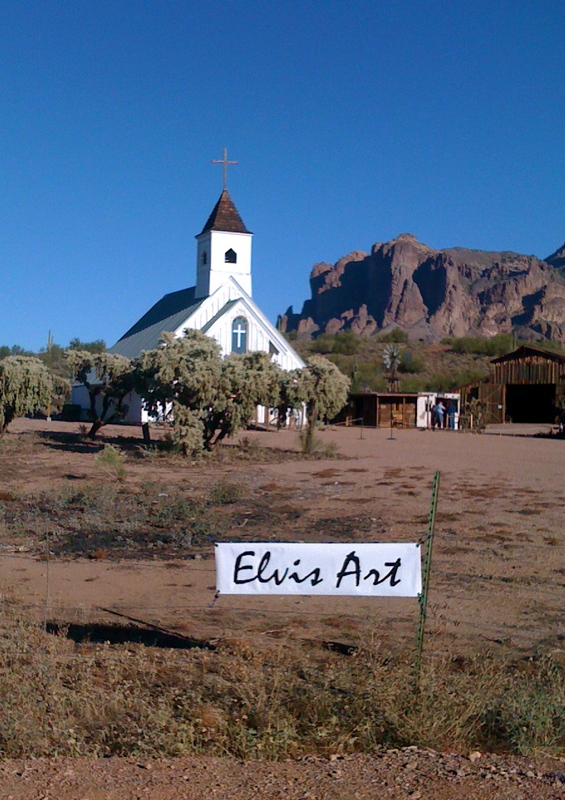 The Elvis Presley Memorial Chapel exhibits movie & TV memorabilia of many Apacheland productions and open to today’s Elvis fans and curious media buffs. 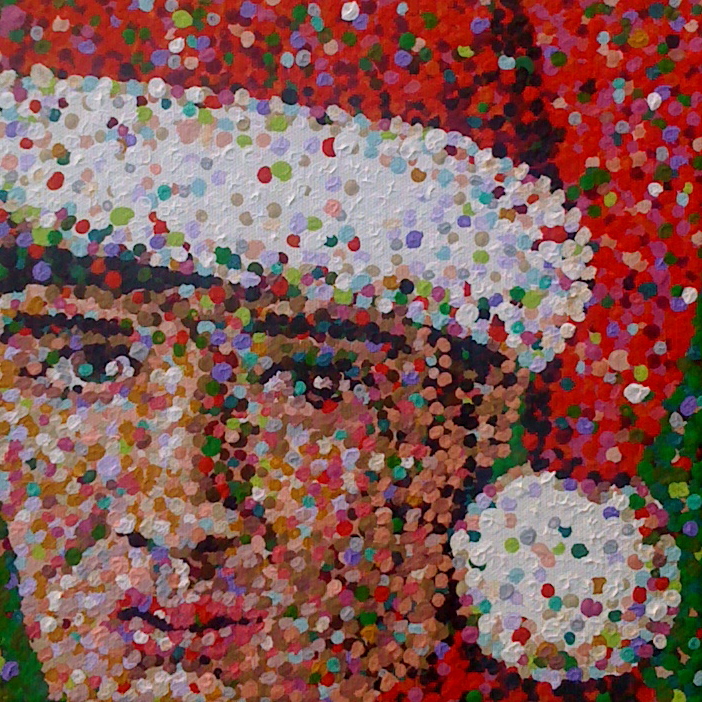 The Remembering Elvis: Many Faces painting exhibit will have an Artist Reception on Saturday, December 18th from 1 – 4pm. 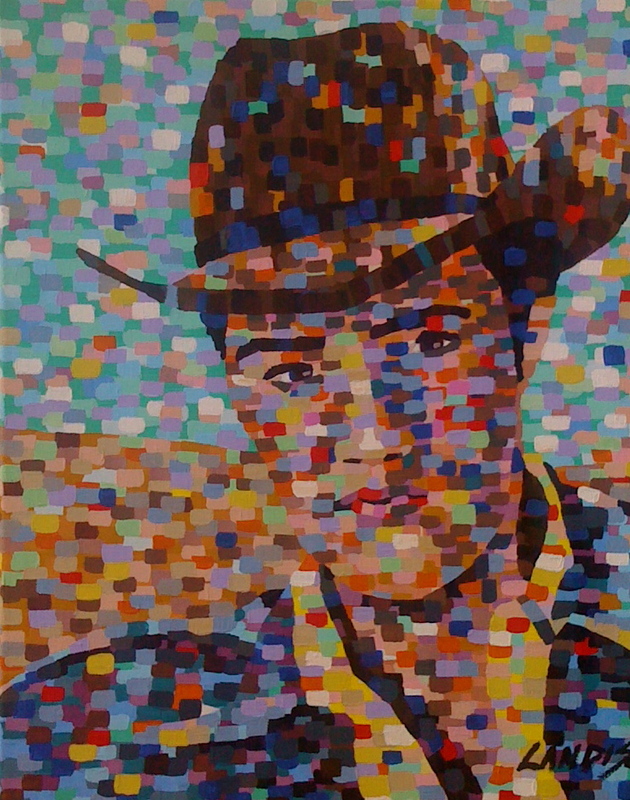 Denise Landis will be sharing her thoughts on Elvis and her art as she provides a painting demonstration of her colorful modified pointillism. Visit the Superstition Mountain Museum at 4087 North Apache Trail, Apache Junction, Arizona 85219. Do you know someone who loves rare or out-of-print books? Wouldn’t one make the perfect gift this holiday season? If so, stop by the Dog-Eared Pages Used Bookstore this Sunday in Phoenix, AZ and see a few of my paintings while you’re at it. Elena Thornton, the founder of the Arizona Consortium for the Arts is hosting “Last Sundays” at this unique bookstore and asked that I present my art! I am really looking forward to visiting with bookstore customers, the staff, and ELENA! Come in and meet all of us! Panacea Wellness Village, a new non-profit organization, is hosting a fundraiser to support their services to heal emotionally & physically disabled people through animal assisted therapies such as Equine Assisted Growth & Learning Association & Animal Assisted Therapy Activities. The groups targeted are at-risk youth, abused women & children, the elderly, & current/former military service members. Join Jon Provost, otherwise known as Timmy from the “Lassie” TV Series, as the evening’s exciting Guest Star. Jon is an advocate and nationally recognized spokesperson for animals and children. 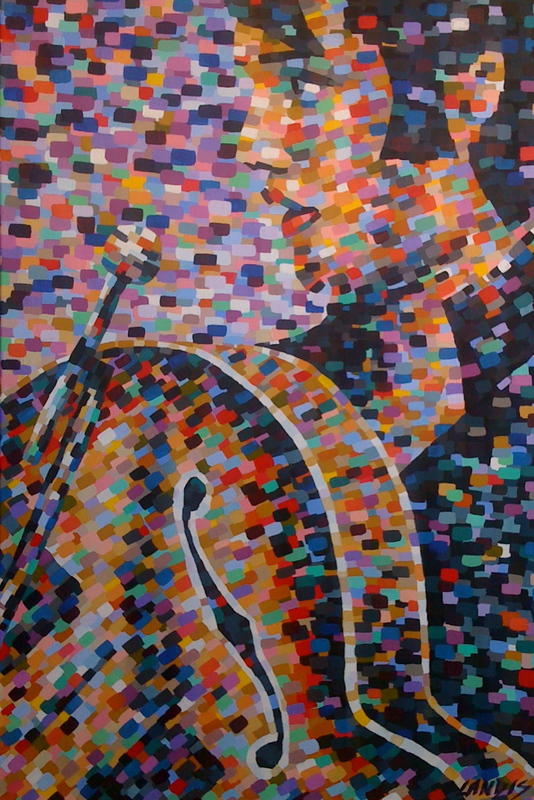 The Blue Guitar Magazine published two of my paintings in their summer online issue. The magazine is a publication of the Arizona Consortium for the Arts http://www.artizona.org and includes area news and the poetry, short stories, and art of Arizona creative types. I am honored that they selected my works to be included in their first summer edition. Check it out! I just made an agreement with ABC & Disney to use my artwork in their television programs & movie scenes as background props. It all happened when Fine Art America http://www.fineartamerica.com announced a partnership with ABC / Disney that will revolutionize the way that artwork is licensed for use on television. I jumped at the chance to be one of the first FAA artists in line! Designing sets for popular TV shows such as Desperate Housewives, Lost, and Modern Family is a high-energy, fast-paced business. With scripts often changing at the last minute, producers and set designers need to be able to design and build new sets in a matter of days. The process of procuring artwork for these sets is particularly challenging because each piece of artwork that gets used as a prop or set decoration needs to be licensed from the original artist and cleared for use on TV. I’ve taken the plunge! Let’s just hope “pointillism” appeals to the producers! Wish me luck! My first introduction to art was while watching my father paint fishing lures atop our family’s kitchen table in rural Arkansas. I was fascinated by the tiny “faces” he created on these treasured objects, not knowing that one day, I too, would assume his passion for art, painting, and portraiture. During my first painting course in college, I was introduced to Pointillism, a unique style of painting originated by French artist George Seurat in the mid-1800s. Oddly, I liked it more than other styles of painting even though it proved a difficult and tedious process. It grabbed me! My mother saved my first Pointillism painting and today, I still sell Giclee’ prints as one of my customers’ favorites. During the 1980’s, I let art & painting “take a backseat” as I pursued graduate studies and became a psychiatric group psychotherapist in Washington, DC and New Jersey. A second introduction to Pointillism was in 1984 when I experienced Sunday In The Park With George, a Broadway play production in New York City. As I watched Mandy Patinkin (as George Seurat, the Father of Pointillism) make his theatrical “dots” on canvas, I knew that this methodical and trance inducing style of rhythmic painting was again calling me back to the arts. Following this experience, I practiced several unique forms of making dots on canvas including can spray painting atop large canvases laid on the floor of a small bedroom-turned studio. These works were primarily given to friends, family, and co-workers, however, several remain in my private collection today. Upon moving to Arizona in 1988, I worked professionally as a psychiatric program administrator until 2000 when I retired early to once again pursue my long-standing art-making dream. My husband, Robert Landis and I built the Landisworks Studio on the property of our home in Apache Junction, Arizona. My desire to paint was reignited and charged with energy, so much so that by 2004, I had transformed into a full-time artist. Since then, I have built a private customer base and have initiated relationships with various art galleries, established art leagues and organizations for potential future exhibits. Today, my paintings fluctuate from using dots to dabs to create fluid impressionistic works. I use brushes of all sizes depending on my artistic whims. I create designs with three styles of “dots or dabs”: 1) Tiny dots in the classical Pointillism style, 2) Perfect circles made by rotating my brush during each stroke, or 3) Large rectangular dabs of acrylic paints. I use musical rhythms to stay on task and may work for hours with no awareness of time. Pointillism portraits and landscapes are my primary subjects since the state of Arizona remains my longstanding “muse”. The cacti, flora, landscapes, and vivid personalities provide continual painting possibilities. However, I have recently been stepping out of the “Desert Box” and creating more images from places I visit or imagine in my dreams. I am fortunate to be able to work from two studio locations. During the summer months, I paint in a small studio in rural Vernon, Arizona and return to my primary Landisworks Studio in the fall and winter months. Landisworks Studio is open for private tours by appointment only. I am more than willing to provide private demonstrations of what I term Modified Pointillism. I also teach classes on Classical Pointillism to students of all ages. For more information about my art, email landis@landisworks.com, visit http://www.landisworks.com, or call 480.205.8436.